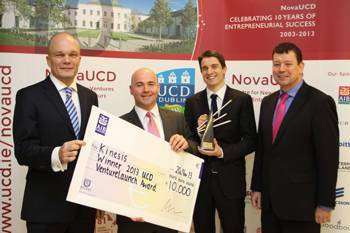 A new health technology start-up company, Kinesis Health Technologies Ltd, has won the inaugural University College Dublin (UCD) VentureLaunch Accelerator Award and the €25,000 prize. They were not the expected winner. What did this company do to win this new award? Kinesis Health Technologies has developed QTUG (Quantitative Timed Up and Go), a novel, patent-protected falls risk and mobility assessment technology. With the rising number of falls with adults over 50, KHT came up with a solution. Their solution? Using an approach agreed by the broad range of healthcare professionals to facilitate objective assessments of falls risk in older adults. For example, take the story of Mary Staker, 58, who fell one morning, broke her hip and since she lived alone had no way of getting help. Her fall resulted in her laying on her kitchen floor for three days. By using QTUG, healthcare professionals can potentially improve healthcare utilization, reduce healthcare costs and improve the quality of life of those at risk. Kinesis Health Technologies (KHT) plans to launch QTUG into the European (Ireland and the UK) and Northern American (US and Canada) markets in mid-2014 and expects to be employing 15 people by end 2016. The founders of Kinesis Health Technologies Ltd are Seamus Small, Dr. Barry Greene, UCD School of Public Health, Physiotherapy and Population Science and Bill Bollinger who is based in the US. Kinesis is a spin-out company that has emerged from internationally peer-reviewed research carried out over the last six years in the TRIL (Technology Research for Independent Living) Centre at UCD. “Innovation is the third pillar of UCD’s core mission, and two of UCD’s key innovation themes are putting knowledge to work and growing and supporting new business,” said Prof Peter Clinch, UCD vice-president for innovation. How do you know if your aging parent needs more care than they can provide for themselves? Some parents are entirely transparent and would be frank enough to tell you they need particular attention because of their old age or if a health condition is bugging them. However, other parents are quite secretive about their feelings because they know how busy you are with your family. • Are you still comfortable living here? • Are you doing fine with your usual home chores or would you want me to arrange for a cleaning lady, maybe Cleaning Services Sydney or locally? • Is your back pain bugging you? Shall we go to your physician for a routine check-up? • It’s so quiet in here mom (or dad), why don’t you come home with me for a change of atmosphere? Your grandchildren would love to see you more when they get back from school. Simple questions can get them talking. From their answers, you can observe how sad your mom, dad, or both of them are in their home. You can also read between the lines of their response if they are wistful about leaving their home or if they are still enthusiastic about usual routine chores and can even manage to do their everyday tasks. This suggests that your parents are again doing fine in spite of their old age and do not need special care yet. However, your parent’s answers to your questions can also offer clues to indicate that they are having difficulties in driving their car or managing their home chores. Your talk with your parent may also alert you that they are burdened by some pain or discomfort when they are doing home chores or just walking or sitting and if they desire relief of such conditions. You may not accomplish much of your goals in screening whether or not your parent(s) needs more care now in just one visit. Situations are often not entirely clear-cut. It is not as easy as visiting them once and convincing them right away that they need special care. Chances are, things will unfold to you after several visits. Most likely, parents will always have mixed feelings about being given more responsibility or considering a change in their living arrangement. But as a son or daughter, your bond of kinship will help you evaluate the situation. Is a Nursing Home an Option? As people live through the different stages of adulthood, each phase is characterized by one or more changes in their functional abilities and desires. At their prime, people enjoy the feeling that they can accomplish any physical task they set their goals on because they enjoy good health and possess the zest and energy to pursue their interests. As your parents grow old and older until that point when they can’t do the things they usually do, the path clears towards longer-term and more specialized care for their needs. Nursing home placement or employing a home-based care-giver are practical considerations. Take time to consider if placement in a nursing home or some other facility or contracting the services of a home-based caregiver is best for their needs on a case-to-case basis. Truth be told, nursing homes have that stigma that drives old folks into thinking they are not loved anymore. Depending on availability in your locale, some forms of living arrangement are better tolerated by aging parents who tend to be too shocked about the prospects of nursing home life or a personal caregiver. Assisted living or a retirement community may be more appealing to them. In an assisted-living arrangement, your parents will live in an apartment or suite on their own. There are usually options for furnished or unfurnished units. Residents of such facilities may also opt to purchase additional services as the need arises. Such extra services may include housekeeping, meal plans, round-the-clock care, transportation, etc. There is also an arrangement for all these services packaged together. • Physically challenged in a minor way, but have no problems with asking for help and receiving assistance. A retirement community may also be a great option, but requires that your old folks are still fully-motivated, physically-independent, not yet physically challenged, and have no incontinence issues or can deal with incontinence issues unassisted. A retirement community is best for retirees who are still able to pursue an active life. If your parent needs nursing home care but is reluctant about the set-up, you may need to reconsider your options and hire a trained home-based caregiver. In another case, your parent may be open to the nursing home idea, but if you are not comfortable with the concept, getting round-the-clock home-based caregiver services will help. Most seniors are at ease with this option because it keeps their dignity intact. It also offers both parents and children the opportunity to spend the parents’ final days with the family. Moreover, even with a chronic illness, the calm and peace of home promotes healing, prevents stress and anxiety, and enhances longevity. Caring for your elderly parent is not just a poignant issue, but a financial load as well on their children if the parents were not able to plan and arrange for a secure transition to old age. Thus, when the family is constrained budget-wise, adult children have to seriously consider taking the challenge of caring for their aging parents themselves. All parents would love this set-up, and most sons and daughters would welcome the opportunity to care for their parents. It is not going to be an easy task, but it will be a rewarding experience. • Your parent’s bed should be as comfortable as possible. If your parent yearns for his or her old bed, arrange for its transport to your place. Next, to balanced nutrition, nothing is more precious for an aging person than a good night’s rest. • Your parent’s bed should be accessible from both sides. Do not place the bed with its one side against the wall. • Ensure that there is a bedside night lamp. Provide fixtures that will permit putting of night lights in the hallway and on the way to the bathroom. • If you have a sentimental parent who prefers his or her old bed, ensure that the mattress is not soiled or saggy, otherwise, keep the old bed but replace the mattress. Your parent’s aching back needs a soft mattress. Using a thick mattress pad increases the comfort and softness of the mattress. • If you are caring for a parent with an incontinence problem, a water-proof mattress is your best option to keep it always dry and easy to clean. • Provide several comfortable and preferably hypoallergenic pillows. • Ensure that the blanket or comforter is of suitable thickness for the season of the year. • Keep a spare blanket near the bedside for easy access when your parent needs it. • Provide a bedside table. Your parent’s essential gadgets should be within easy reach and place them on this table is an ideal location. Such devices could include their reading and distance glasses, dentures, hearing aide, remote controls for thermostat and television, etc. Aging parents being cared for at home by their sons or daughters complain a lot, not just about their deteriorating condition, particularly their persistent weakness, but also about losing their independence. Wait a minute; is this turning out to be a reversal of roles? Do you remember how you used to resent your parent’s setting of limits and how you felt your independence is being curtailed? This is almost exactly what they might think about your overwhelming concern for their safety, and you know much better now that it had always been for your own good. Now it’s your turn to convince them too that you are just looking out for their safety and well-being. The aging of the populace, in general, is hailed as a triumph over disease and life-threatening injuries. This acclaimed outcome of man’s continued quest for humanity’s survival poses an accompanying challenge to healthcare professionals and caregivers along the area of falls prevention. In other words, the improving longevity of man also triggers a significant increase in falls and fall-related injuries. From your viewpoint as a caring and loving son or daughter of an elderly parent, keeping your parents safe from preventable accidents is an utmost concern. Even to the extent that your aging parent feels some loss of independence, the trade-off for preventing accidents and falls is always acceptable. The good news, however, is that there are a lot of simple ways by which you can reduce the risk of falls and injuries without making your parent feel that he or she is losing more and more of his or her independence. • Eliminate clutter that may trigger tripping, falls, and other accidents. If you get rid of the usual and innocent-looking triggers, falls and accidents at home can be prevented. Leave no shoes on the stairs; free your doorstep of tripping hazards like a newspaper or toys; clean your kitchen floor, and eliminate any rugs with thick edges. • Organize your home for elderly comfort. Many falls and accidents happen while an elderly person is trying to reach for something beyond the limits of their functionalities. See to it that the items they need or use frequently are between their waist and shoulder level. Old people become victims of nasty falls when they attempt to get hard-to-reach items by climbing on stools, stacked books, and even while using stepladders. Provide handy tools or equipment to help them reach for items on high shelves. Offer them a long-handled reacher or similar equipment and show them where it is kept. Teach them to use it instead of climbing using furniture or stepladders. • Maintain a safe bathroom for the elderly. Install grab bars in the shower area where they can hold on to. The elderly usually find it difficult to stand for more extended periods or walk without an aide to stabilize their balance. Grabs bars are also an essential feature beside the toilet. Provide them with a safe shower seat. Put a rubber mat in the shower and even in the tub. Bolster safety with a non-skid rug adjacent the rubber mat when possible. Wet surfaces are accident-prone areas for the elderly. Always remind them to take things slow and easy. • Use proper lighting to help their failing eyesight. Light the path they traverse at night like hallways and stairways. Put a unique light near the toilet seat and leave it on during the evening. A well-lighted house can help prevent night falls for the elderly. The functional limitations of elderly people make them vulnerable to tripping-induced accidents. Ensure that rugs do not cause falls. You can either secure the carpet using Rug Grippers, a non-slip surface which can be attached at the bottom of a carpet. Rubber-backed rugs are ideal. You can even secure the rugs directly with a double-sided tape. • Provide proper footwear for your aging parents and convince them to use it. Get rid of their shoes with slippery soles. Remind them not to walk in their socks or stockings alone. During the cold season, provide them socks which rubber pads that can be purchased from hospitals and select medical supplies stores. Do not give them athletic shoes, especially those with thick soles and deep treads which may get them stuck on surfaces and could lead to falls. The best footwear for the elderly is supportive, low-heeled shoes. Shoes with elastic laces are ideal. • Keep your stairs safe. Endeavor to install handrails on both sides of the stairs. Maintain dry, non-skid stair surfaces. Fall-proof stairs should not be slippery. Keep the stairs well-lighted. Use fluorescent tape on the edges of the top and bottom step of stairs as a readily visible warning strip. As a better option, you can locate your parent’s room downstairs or on the main floor of the house. As an additional precaution, put all their frequently used items in their bedroom or at least on the main floor. Minimizing the need for them to use the stairs means the lesser risk of falls and accidents associated with stairs. • Monitor the effect of some medications. The goal of this tip is to ensure that your elderly parent maintains a high level of alertness during the day to prevent falls and accidents. If they are taking prescription medications that may affect their balance or cause light-headedness or dizziness, they have to be given supervised attention during their waking hours. Some cardio-vascular drugs, anti-depressants, and pain relievers cause dizziness, sleepiness or balance issues. Even before a fall occurs, it helps to ask your parent’s physician if some prescribed medications may lead to falls due decreased alertness or dizziness. Such drugs can be altered, or the dosage may be changed. This is an area best discussed with your parent’s attending physician. • Consider the option to let your parent use canes or walkers. Many people are in denial that they are getting old and may need special aids to get by. Some are even too vain to accept that getting old is an inevitable stage in the human life cycle. However, the fact doesn’t change that a cane or walker can significantly help keep their steps steadier. Observe your parent or ask a physician to examine your parent’s gait. A cane or walker can help prevent falls due to balance issues. Besides, if your mom is fashion-conscious, there are nice-looking canes that won’t detract from your mom’s impeccable taste and style. • Encourage your parent to exercise for balance improvement. If your parent’s balance is slowly or abruptly being impaired, the doctor can recommend specific exercise routines to improve balance. Often, a physical therapist in tandem with the physician can substantially help improve stability and prevent falls associated with balance problems. Your part is to encourage and inspire your parent to adhere to the regimen and do it regularly. It will help if you can do the exercise with your mom or dad.